In today’s tech-filled world, transferring data from one device to another is simple – sometimes as simple as just touching two devices together. Another concept for dead-simple data moving is a suite of products called inTouch from business technology group VTT. 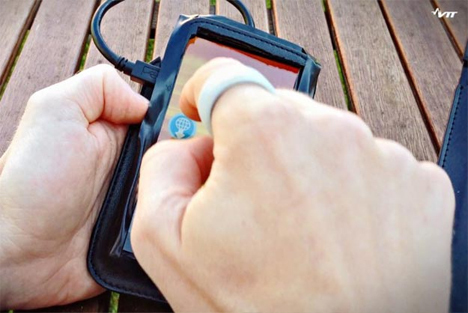 The products include a ring, a “functional fingernail,” and a wristband. By wearing one of these objects and touching the screen of the source device, users can temporarily store the data on the wearable object. They then touch the object to the destination device – a friend’s smartphone, a tablet, or even your car. 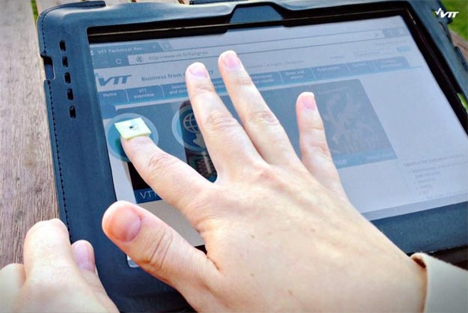 VTT says that the technology could also be used in a healthcare setting to help doctors keep track of patients’ vital signs. Eventually, the wearable objects could act as passwords for online accounts or even to unlock your car or house doors effortlessly. See more in Various Gizmos or under Gadgets. November, 2013.